Our clinic offers the latest in chiropractic care and physical rehabilitation therapies. Our goal is to utilize these methods of therapy to improve your condition, strengthen the injury, and help prevent the problem from happening again. The combination of therapeutic exercises and massage therapy are designed to offer the best rehabilitation experience you can receive, all at one place. You can make an appointment with our office by calling (215) 628-2529, or you may also request an appointment through our website, available 24 hours a day. Our staff will do our best to respond to your request, and get you in for an appointment as fast as possible. We have morning and evening hours, and are open 7 days a week. Our office is an in network provider for Blue Cross PPO, Blue Shield PPO, Aetna HMO/PPO, Amerihealth, Independence Administrators, Personal Choice, Keystone Health Plan East, Merck Blue Cross and Merck Aetna PPO, Auto accident and Worker’s Compensation cases. We will verify the coverage for you, explain your visits and financial information, and answer any questions you may have. Our staff will submit the paperwork for your visit to the insurance company, so you don’t have to worry. If for some reason you are unable to attend your scheduled appointment, please give us as much notice as possible. That way we can provide that appointment time to another patient who may need to come in. We appreciate you consideration in this matter, and we understand that things come up last minute as well. If you are changing your insurance plan, please provide our staff with the information as soon as possible, so we may help you determine what your new health coverage plan will cover. Some plans require a referral or pre-certification before your treatment, so it is important that we are made aware of any changes to your health insurance as soon as you are aware of the new information. If there are any questions please contact our office and we are willing to help you out. Dr. Conrad is an alumnus of the Millersville University and Blackthorn Men’s Rugby Teams. His clinical knowledge and playing experience helps him get athletes back to their workouts as soon as possible. Check out some reviews from our clients on google and google maps. We look forward to offering you the same high quality chiropractic care that we offer al of our patients in the Lansdale PA area. Great staff, very knowledgeable and professional. Regardless of the type of injury, they are excellent at explaining the injury, and the steps of rehab, as well as how to avoid future injury. Hours are a huge plus too. 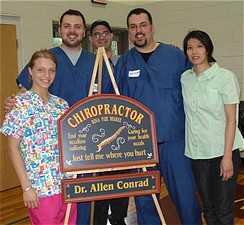 "Fantastic Doctor, Allen Conrad leads his team - not only impacting the community at large but also assisting the entire profession. He has continually impressed me with his skills and I highly endorse his center !" "Very friendly staff! 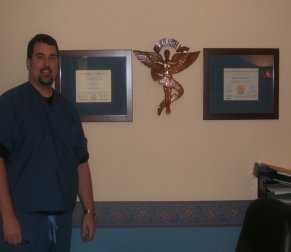 Dr. Conrad is a knowledgeable and experienced chiropractor. Nothing but great things to say. He is always coming up with ways that work best for the patient. I would recommend him to anyone!" The Montgomery County Chiropractor Center is located in the North Wales Pa, and has been helping the local community with chiropractic care and massage therapy for the past decade. Copyright ©Montgomery County Chiropractor Center 2018 . All rights reserved.